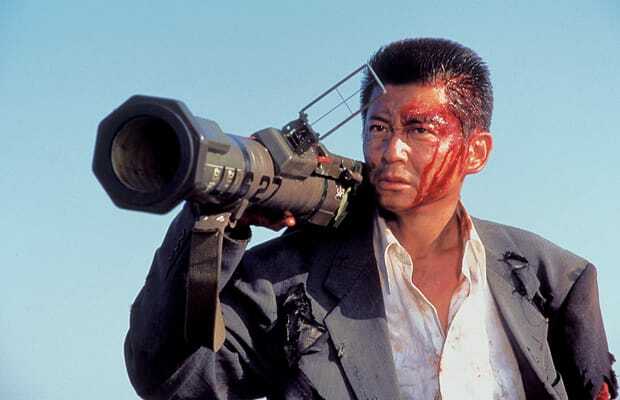 Probably the most violent film on this list, Takashi Miike’s drug-entrenched cinematic piece Dead Or Alive will leave you shocked, cringing, and wanting to go sit inside a quiant park flanked by trees. From the snorting of 15-foot lines of coke to bazooka-blasting, arm-severing and laser-crystal-firing, the violence here is consistently bonkers. Dead Or Alive finds a Chinese yakuza member (played by the always serious Riki Takeuchi) battlingagainst a Japanese killer (Sho Aikawa) in the rugged lands of Tokyo’s Shinjuku area. The film is at times, comical, but there’s no doubt that the final battle scene, soaked with tanks of blood, is one of the genre's most entertainingly brutal sequences.